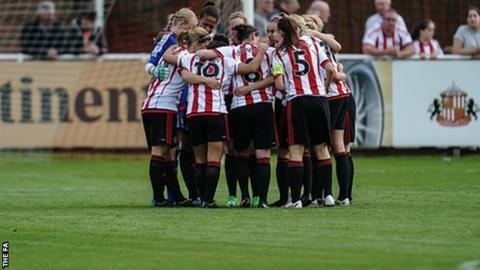 Sunderland manager Carlton Fairweather says his side can have "a very big say" on who wins the Women's Super League One crown after their own title hopes were all but dashed on Sunday. Defeat at Manchester City saw Sunderland drop to fourth in the table, six points behind leaders Chelsea with two games remaining. They next host Arsenal before facing Chelsea on the final day of the season. "We will have an effect on the title in some way," Fairweather told BBC Sport. While Sunderland can still catch Chelsea, the Lady Black Cats have an inferior goal difference of six and a slim chance of overtaking the Women's FA Cup holders. However, Sunderland inflicted the heaviest defeat on Chelsea this term, beating Emma Hayes' side 4-0 in July. The Lady Black Cats topped the WSL 1 table at the end of July but have since lost ground at the summit after taking just two points from three games in the league since. Fairweather admits his side's chances of lifting the trophy are now gone. "I think, realistically, you can say that, with the games that we've got," he added . "But we're going to keep plugging away and keep playing well." With the top two in WSL 1 earning a Champions League spot, Fairweather says the stakes on the final day at Chelsea are likely to be high for both clubs. "Obviously, that will be the last game and that will be a very important game for both sides," he said. "If we can keep on playing and creating the chances that we create, hopefully we can get something from those two games left."